Product prices and availability are accurate as of 2019-04-14 08:58:55 EDT and are subject to change. Any price and availability information displayed on http://www.amazon.com/ at the time of purchase will apply to the purchase of this product. 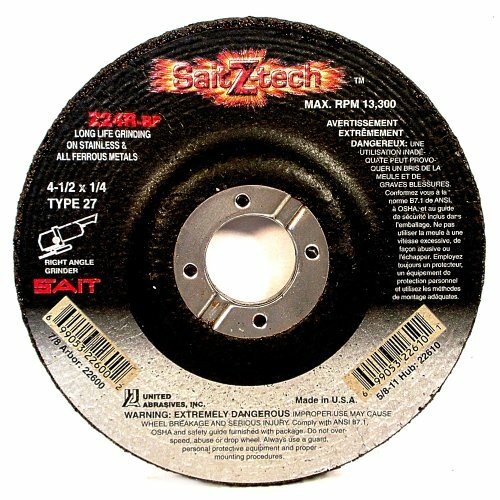 United Abrasives, Inc./SAIT is a privately held company that was established in 1970. Our relationship with SAIT, an Italian corporation founded in 1953, began as we first manufactured coated abrasive belts. By 1975 we had expanded our production to include bonded abrasives. The strong commitment between United Abrasives, Inc. and SAIT continues today. We are well-known worldwide for quality, consistency, and the highest levels of service. We are one of the largest and leading manufacturers of abrasive products in the world. We only use premium materials. We demand consistent manufacturing operations and have the most rigorous quality control testing in the industry. United Abrasives manufactures a full line of bonded abrasives: grinding wheels, cutting wheels, cup wheels, cones, plugs and a host of similar bonded products. We also manufacture a wide variety of sanding sheets, belts, rolls, flap discs, fiber and PSA discs. Plus, we offer a broad line of wire brushes, non-woven abrasives, precision diamond-cut Tungsten Carbide Burs, diamond wheels, and a full line of accessories. Z24R Zirconium. Tough zirconium grain. High performance grinding for the toughest applications. Ferrous metals (iron, steel, welds). Stainless steel, high tensile alloys. The highest quality zirconium grain. All sizes made with uniform grain throughout, no filler grain used. Super-Lock Hub on all 5/8-11 threaded arbors in the safest, bibration-free design.